In this short book Dr. William W. Wells has done a superb job of honing in on the essential theological differences of Mormonism and the Historic Christian faith. John Maxwell has made the statement, “Everything rises or falls on leadership.” Dr. Wells wastes precious little time in demonstrating in his book that in religion everything rises or falls on its theological underpinnings. After a brief introduction, and history of the Mormon faith – Wells defines Christianity by focusing on its essence or ontology. He brilliantly illustrates historically and theologically what indeed suffices for the reality of Christianity. He clearly and concisely illustrates the theological foundations of Christianity centering on three core affirmations: (1) The character and nature of God as Triune; (2) The person and work of Jesus Christ; and (3) The creation and nature of humanity. In comparing and contrasting the foundations of Historical Orthodox Christianity from the Bible and Church history with the Mormon teachings on their understanding of the nature of God, man, Christ, creation, and salvation the only similarities are the terms or language used by each. The definitions, doctrines, and practices of Mormonism and Christianity could not be further apart. Wells does very little by way of interpretation or application – he allows the authoritative documents of Mormonism and Orthodox Christianity to speak for themselves. I highly recommend this book for anyone who wants to understand what makes Mormonism tick, and how it is absolutely unrecognizable from anything that resembles what C.S. Lewis called “Mere Christianity.” Mormonism as articulated by its own authoritative documents is actually a total departure from the core foundational doctrines of the Christian faith. It is not mere Christianity – it is mere heresy. The Mormon faith is not Christian based on its theology in any way shape or form. This isn’t to say that Mormons and Christians share many of the same values and even beliefs. However, when it comes to all of the key elements that make one a “Christian” – the facts in this book speak for themselves – Christian theology and Mormon theology are about as close as Hawaiian weather and Antarctic weather are alike. Wells with the uttermost graciousness has simply provided the cardinal theological beliefs of Mormonism and Christianity side by side and in a very compelling way has shown that they are distinct, different, and not remotely close. I highly recommend this book as a resource to find out the truth about what Mormons really believe (from their own authoritative documents) and what Christians really believe (from the Bible and Church History) and why this is of eternal significance. Dr. Wells has shown that theology – what people believe about God, creation, mankind, salvation, and eternity is of massive importance. I hope that this book receives a wide reading by Christians, Mormons, and anyone concerned about their own soul, and the souls of others. 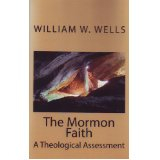 About the Author of The Mormon Faith: Dr. William Wells completed an undergraduate degree in Anthropology at Wheaton College and graduated from Trinity Evangelical Divinity School in Deerfield, IL. He also earned a Ph.D. in Philosophy and Religion from Syracuse University in NY. Upon completing his doctorate in 1970, he taught at the University of Hawaii, Hilo College and later at Regent College in Vancouver, B.C. & the Graduate School of Theology at Wheaton College. In his forties, Dr. Wells left academia and a few years later joined Wycliffe Bible Translators. Now retired after twenty years of service with Wycliffe, he lives in Southern California where he continues to teach and write. He has also written A Brief Introduction to the Bible; and Faith of Our Fathers: An Introduction to the Evangelicals. I had an opportunity to read Dr. Wells commentary on the Book of Job. It is the first and only commentary on Job that I believe captors the essence of what God was trying to convey. I love the way Dr. Wells tries to tie the book of Job in with the rest of the Bible and explains in details and generalities the mysteries and misunderstandings that have surrounded this very important book of the Bible. I would love to see more commentaries and writings from this very wise and knowledgeable author and theologian who has not been given the honor and status he deserves.